Olive Thompson, of Hermitage passed away on Wednesday August 1, 2018 at St. John XXIII Home following an extended illness. She was 103 years old. She was born in Sharon on July 13, 1915 the daughter of Bart and Anna (Schnable) Taylor. Olive was a lifetime member of the East Side Church (Baptist Disciples of Christ) in Sharon where she had been a member of various groups including the Wednesday Morning Prayer Group, Sanctuary Choir, Christian Women Fellowship Missionary Group, and Church Women United. Her memberships also included the Shenango Valley Interfaith Ministries, Christian Associations of the Shenango Valley, and the Shenango Valley Walking Club. 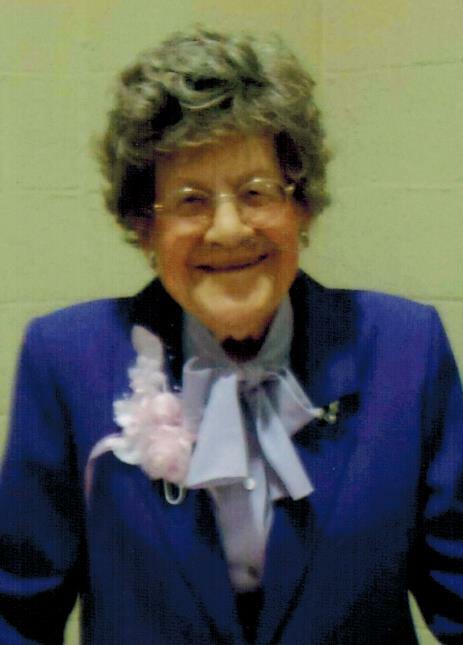 She was very active with the Shenango Valley Meals on Wheels, and had been a volunteer for over fifty years for the Sharon Regional Hospital and its auxiliary where she retired at age 101. She was honored as a Buhl Day Honoree and the Sharon Regional Volunteer of the year. Olive was also honored by Pennsylvania State Representative Mark Longietti for being one of only six sets of twins in the United States to reach over 100 years of age. Mrs. Thompson retired after twenty-seven years of service as a teacher’s aid from the Mercer County Crippled Children’s Society. Olive’s memory will live on through her niece Joyce Cartwright of Hermitage, her nephews Richard Gereb and his wife Sherry of Clark, and Donald Gereb of Sharon; and by many others nieces, nephews, great-nieces, great-nephews throughout the country. She was preceded in death by her husband James B. Thompson on April 10, 1989, her brothers Rev. Raymond Taylor and Ambrose Taylor, and by her sisters Gladys Hall, Eleanor Patterson, Doris Heisterkamp, her twin Opal Thysell, and Betty K. Gereb. A funeral service will be held at 3:00PM on Friday at the Sample-O’Donnell Funeral Home 555 East State Street Sharon, PA 16146 with Rev. Craig Thompson, Pastor. Friends may call beginning at 1:30PM until the time of the service. Burial will take place America’s Cemetery. In lieu of flowers and to honor Olive’s memory, donations may be made to the East Side Church or to the charity of the donor’s choice.